Custom sprite sheets are a hobby of sorts for some. A sprite sheet is a series of characters, usually the same character or a series of characters in different poses. Their original use was for video games, so that the animations of a single 2d character could be stored in a single file. Over time fans of video games would be able to pull those sprite sheets out of the game, and as those sprite sheets became available, fans would create their own. 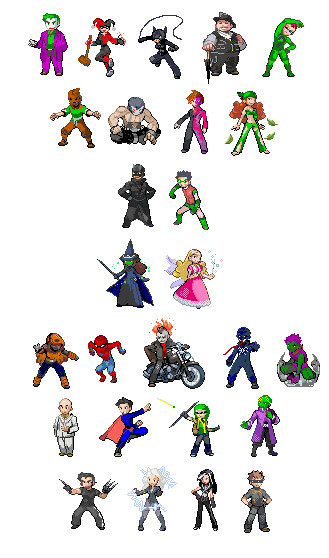 These new sprite sheets range from near direct copies, or mild redesigns of characters straight from the game to unique characters designed from the ground up, often though landing in the middle, recolors and modifications to existing characters intended to create unique characters in the same style. In Envisioning Information, Tufte talks about how small multiples can provide a “scope of alternatives”. In this case the artist shows what multiple characters, who may not otherwise be seen alongside each other would look like, without having to recreate the entirety of Gotham City. The “constancy of design” that Tufte talks about comes not from internal consistencies, in this particular case, but by using a style that speaks to a particular community. This style speaks directly to the type of people who would most appreciate the work.